We first met Lissie Maurus seven years ago when she stopped by our once glorious Guest Apartment, cramming into the tiny room and shaking the picture frames off the wall. The video feels a bit like a time capsule at this point...my oh my, have we come a long, long way in the production department. But the Rock Island IL native's voice is as big and bold as ever. 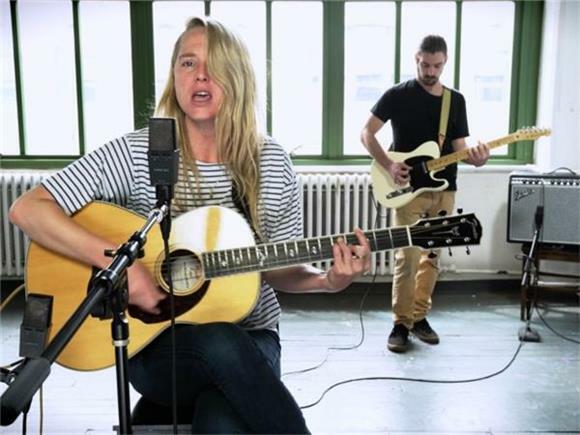 Lissie is a country bred powerhouse...her voice careens off picturesque, Midwestern silos and echoes across the heartland. She's the product of her upbringing, and it shows in our newest session. Swinging by our current hideout in Sunset Park Brooklyn, Lissie brought three songs from her most recent album, My Wild West. The album is an ode to her 2nd home in California, where she lived for the last ten years or so. It's dotted with tracks titled "Hollywood", "Wild West", and "Ojai". But she recently returned to her Midwestern roots, purchasing a farm and a pickup truck in rural Iowa (I guess that would pretty much be all of Iowa...). The way she described the place to us sounds idyllic; a country home where she can relax and reflect, bump around the fields in her truck, strum her guitar on the porch, and eventually build a studio in the barn where musical mates of all stripes could stop in for a visit and a jam session...a new adventure in her own personal, wild (mid) west.